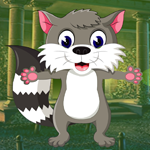 G4K Gray Squirrel Escape is another point & click escape game developed by Games4King. There was a small village in a beautiful magnificent forest. The village was very beautiful to see. There was a gray squirrel in that village. One day, that gray squirrel got unexpectedly stuck in a house of one of the villagers. It is your duty to rescue the gray squirrel. It will help you to find the hidden clues in the form of colours and numbers and to find the items where the gray squirrel is to save this animal. Find them all and solve all puzzles to free the gray squirrel. Good luck and have fun! Got a few minutes, hope I can play without being disturbed. Sneaky clue paper in right scene, behind little crystal near pillar in background. Iron ball goes into a hole with a different shape. Drag pattern in 3x3 puzzle. Hi Chris, thought I was alone here. I think you mean that slider thing on door with 6 pink shields. Not there but I'm not looking forward to it. Chris was right, that puzzle was a PITA. Make sure you've got charged batteries for the mouse. Decent game with much back-and-forth, of course I didn't mention the obvious things.